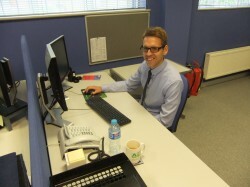 Hampshire Mezzanine Floors are delighted to welcome Matt Smith to the team as our new AutoCAD Draughtsman. Matt joins Hampshire Mezzanine Floors with years of experience in the construction industry through surveying, the production of AutoCAD drawings and has also spent a few years as a part-time labourer. He has previously gained valuable experience in analysing and processing data accurately to produce detailed AutoCAD survey drawings to the specifications of clients and colleagues. Moreover, Matt’s ability to utilise his excellent working knowledge of AutoCAD to be able to produce work of the highest standard made him the ideal candidate for the role. Matt’s life-long passion for architecture is reflected in his experiences, having studied subjects such as Graphic Design, Fine Art and Photography in his college years and then graduating with a 2:1 in Architectural Technology at Southampton Solent University. In an attempt to further improve his career prospects and move into a role he feels is more suited to his skills and ambitions, Matt has joined HMF’s drawing office, where his creativity, enthusiasm and wide range of abilities will be extremely beneficial to us here at Hampshire Mezzanine Floors. Outside of work, Matt regularly enjoys playing for his local 5-a-side football team as well as supporting his beloved Manchester United. His passion for sport is further portrayed in his enjoyment of golf, tennis and skiing. We are very pleased to have Matt join us and hope that he enjoys working here at Hampshire Mezzanine Floors.